This year’s top prize for Smogathon – a unique Krakow-based anti-pollution innovation competition – went to Takachar, a waste management startup founded by a Taiwanese PhD student at MIT. Entrepreneur Kevin Kung’s company is developing portable devices which can easily upgrade biomass (biological material such as wood pieces and coconut shells) to increase its energy and volume density, allowing it to be transported more easily and used for fuel instead of burnt as waste. The company also promises that it will enable poor farmers in developing countries to profit significantly from being able to sell their excess biomass in this form. The award, worth 15,000 USD, was announced at Smogathon’s Grand Finale at Kino Kijów on Monday evening. The event was festive, with a specially brewed “Smoggy” beer, food, and live music. The six finalists had a chance to make final five-minute pitches on stage before a jury who awarded them points, which complemented previous assessments by experts to determine the ultimate three prizes. The second prize ($10,000) went to Indrio, a startup which emerged from research at Stanford University and aims to reduce emissions of toxic nitrogen oxides (NOx) which contribute to smog. Indian firm Pi Green Tech Solutions took home the $5,000 third prize for their “carbon cutting machines” which separate pollutants (that can later even be reused for ink and paint) from the air without a filter. There was also a separate implementation prize worth 30,000 PLN for a company developing installations to clean the air near public transport stops. 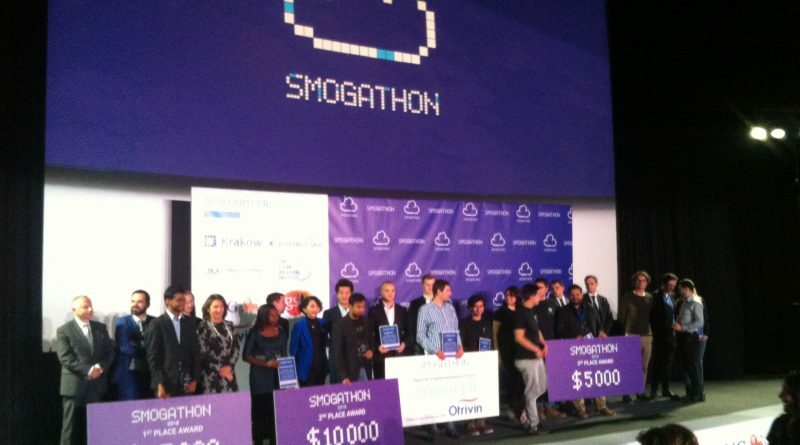 Smogathon began four years ago as a hackathon in Krakow to develop anti-smog solutions. Now it has developed into an international network of competitions connected to this final stage in Krakow, where tech startups from all over the world compete to win funding for their innovations against air pollution. Funding comes from the city of Krakow and its surrounding Lesser Poland voivodeship (which have severe seasonal problems with smog), the Clean Breathing Institute, and several corporate sponsorships. 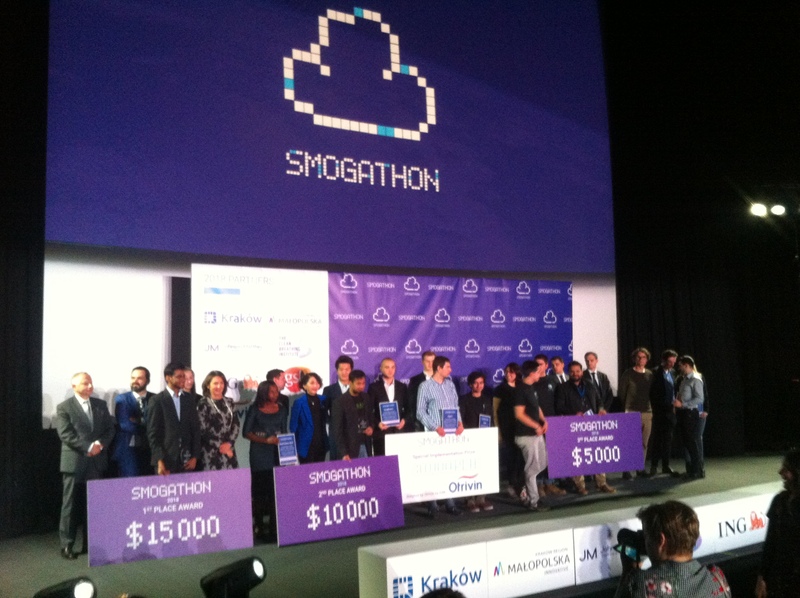 Previous Smogathon winners include Airly, whose pollution-monitoring stations around Poland power the smog widget in the right sidebar of the Krakow Post website, and Radic8, whose indoor boxes to filter dirty and unhealthy air will soon be installed in cities around the country.